Waco, TX – April 2, 2018 – Imagine being a newly married couple faced with the task of moving – not just down the street, a few states over, or on the other side of the country – but to a new country, one where you know no one. This is the same challenge Annie and Matt Hepp faced when a job opportunity moved them from Vancouver, Canada to Waco, Texas. Annie and Matt met at Simon Fraser University in Canada. After graduation and shortly after getting married, a job opening at Texas Parks and Wildlife brought them and their two dogs to a foreign land called Texas – Waco to be exact. Being accustomed to the incredibly expensive housing market in Vancouver, Annie and Matt never saw homeownership as a possibility for them. The average home in Vancouver costs over 1 million dollars, leaving over half the city to waste their money on rent. 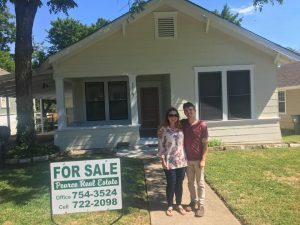 However, after a friend from Texas introduced Annie and Matt to NeighborWorks Waco, they quickly realized homeownership would be achievable in Waco. The Hepps were credit-worthy and payments would be affordable for them, but they lacked the necessary funds for the down payment. With NeighborWorks Waco down payment assistance, though, their newfound dream became a reality. “NeighborWorks [Waco] genuinely cares about helping people and took the time to explain everything,” says Annie. “Buying your first home is really overwhelming, but NeighborWorks [Waco] helped us feel confident and comfortable with our decision.” The organization helped Annie and Matt through all of the obstacles that come with being a first-time homebuyer – from researching realtors and lenders to signing the mounds of paperwork at closing to filing their homestead exemption – and everything in between.